Soils with low infiltration capacity (tight soils) are defined as soils with steady-state infiltration rates equal to or less than 0.06 inches per hour. County soil surveys are useful for initial screening to identify soils that may have low infiltration rates. Most county soil surveys are available digitally from the NRCS (National Resources Conservation Service). These surveys are not accurate enough to determine site-specific characteristics suitable for infiltration systems but are useful for initial screening. If there is a potential for slowly infiltrating soils to exist on a site, a detailed site analysis should be performed for all proposed infiltration BMPs (Susilo, 2009). Additional information on soils can be found here. Stormwater management limitations in areas with tight soils generally preclude large-scale infiltration and ground water recharge (infiltration that passes into the ground water system). These soils will typically be categorized under Hydrologic Soil Group (HSG) D. The table below provides a general summary of infiltration rates for different soils. These are conservative estimates of long-term, sustainable infiltration rates that have been documented in Minnesota. They are based on in-situ measurement within existing infiltration practices in Minnesota, rather than national numbers or rates based on laboratory columns. 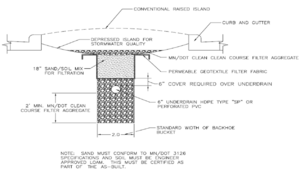 The Construction General Permit (CGP) prohibits infiltration when an infiltration system will be constructed in areas of predominately Hydrologic Soil Group D (clay) soils. Caution: The table for design infiltration rates has been modified. Field testing is recommended for gravelly soils (HSG A; GW and GP soils; gravel and sandy gravel soils). If field-measured soil infiltration rates exceed 8.3 inches per hour, the Construction Stormwater permit requires the soils be amended. Guidance on amending these soils can be found here. The values shown in this table are for uncompacted soils. This table can be used as a guide to determine if a soil is compacted. For information on alleviating compacted soils, link here. If a soil is compacted, reduce the soil infiltration rate by one level (e.g. for a compacted B(SM) use the infiltration rate for a B(MH) soil). A Although a value of 1.63 inches per hour (4.14 centimeters per hour) may be used, it is Highly recommended that you conduct field infiltration tests or amend soils.b See Guidance for amending soils with rapid or high infiltration rates and Determining soil infiltration rates. *NOTE that this table has been updated from Version 2.X of the Minnesota Stormwater Manual. The higher infiltration rate for B soils was decreased from 0.6 inches per hour to 0.45 inches per hour and a value of 0.06 is used for D soils (instead of < 0.2 in/hr). aThis rate is consistent with the infiltration rate provided for the lower end of the Hydrologic Soil Group A soils in the Wisconsin Department of Natural Resources Conservation Practice Standard: Site Evaluation for Stormwater Infiltration. bThe infiltration rates in this table are recommended values for sizing stormwater practices based on information collected from soil borings or pits. A group of technical experts developed the table for the original Minnesota Stormwater Manual in 2005. Additional technical review resulted in an update to the table in 2011. Over the past 5 to 7 years, several government agencies revised or developed guidance for designing infiltration practices. Several states now require or strongly recommend field infiltration tests. Examples include North Carolina, New York, Georgia, and the City of Philadelphia. The states of Washington and Maine strongly recommend field testing for infiltration rates, but both states allow grain size analyses in the determination of infiltration rates. 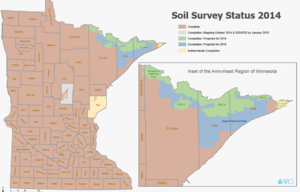 The Minnesota Stormwater Manual strongly recommends field testing for infiltration rate, but allows information from soil borings or pits to be used in determining infiltration rate. A literature review suggests the values in the design infiltration rate table are not appropriate for soils with very high infiltration rates. This includes gravels, sandy gravels, and uniformly graded sands. Infiltration rates for these geologic materials are higher than indicated in the table. References: Clapp, R. B., and George M. Hornberger. 1978. Empirical equations for some soil hydraulic properties. Water Resources Research. 14:4:601–604; Moynihan, K., and Vasconcelos, J. 2014. SWMM Modeling of a Rural Watershed in the Lower Coastal Plains of the United States. Journal of Water Management Modeling. C372; Rawls, W.J., D. Gimenez, and R. Grossman. 1998. Use of soil texture, bulk density and slope of the water retention curve to predict saturated hydraulic conductivity Transactions of the ASAE. VOL. 41(4): 983-988; Saxton, K.E., and W. J. Rawls. 2005. Soil Water Characteristic Estimates by Texture and Organic Matter for Hydrologic Solutions. Soil Science Society of America Journal. 70:5:1569-1578. 1 Why are soils with a low infiltration capacity a concern? 3 What are general stormwater management guidelines for sites with low infiltration capacity soils? Why are soils with a low infiltration capacity a concern? Sites with low infiltration capacity soils may limit the type, location, number and/or sizing of infiltration BMPs that can be used for stormwater management. Low infiltration rates result in extended surface ponding of water, which may damage vegetation, lead to mosquito breeding, damage soil structure, and reduce pollutant treatment by the BMP. 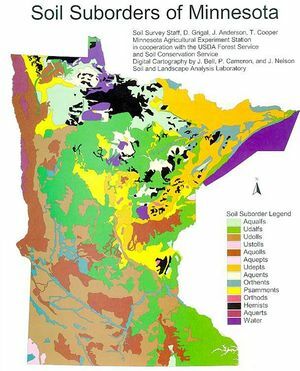 Certain watershed organizations in Minnesota do not allow the use, or strongly discourage the use, of infiltration BMPs where soil infiltration capacity is low. This does not mean, however, that these soils do not have any infiltration and recharge capabilities. It may be possible for sites to partially or fully meet infiltration objectives as long as appropriate design modifications have been incorporated, such as amending the soil with compost or sand, or incorporating an underdrain into the practice. The following table provides an overview of design considerations for several groups of structural practices. Bioretention system with infiltration gallery. Bioretention, dry swale, permeable pavement, tree trench/box Should be constructed with an underdrain. Recharge criteria, if applicable, can be met by modifying the design to include an infiltration gallery below the underdrain, so long as it is appropriately sized. Media filter Recommended practice in tight soils. Some design variants can be modified to incorporate an infiltration gallery that can help meet recharge criteria, if properly sized. Stormwater ponds Acceptable practice with tight soils. Soils should help maintain permanent pool. Acceptable practice with tight soils. Soils should help maintain permanent pool if practice is not tied into groundwater table. Soil tests to determine infiltration capacity of soil should be performed at all proposed stormwater facilities that plan to have a recharge or infiltration component to their design. The purpose of the testing is to identify and confirm the soil characteristics and determine suitability, if any, for infiltration BMPs. Guidelines for investigating all potential physical constraints to infiltration on a site are presented in a table at this link. These guidelines should not be interpreted as all-inclusive. The size and complexity of the project will drive the extent of any subsurface investigation. Soil testing is recommended for all proposed stormwater facilities that plan to have a recharge or infiltration component to their design. Testing can be less rigorous than that for karst areas or sites with shallow bedrock and groundwater. The investigation is designed to identify and confirm the soil characteristics and determine their suitability, if any, for infiltration practices. Infiltration trenches, bioretention, and filters - a minimum of 2 per practice. Note that more borings are recommended for infiltration BMPs greater than 5000 square feet in area. See here for recommendations on number of borings for infiltration BMPs as a function of BMP size. Borings should be extended to a minimum depth of 5 feet below the lowest proposed grade within the practice unless auger/backhoe refusal is encountered. The following references provide useful information for conducting geotechnical investigations. Note that some of these documents were written for investigations at contaminated sites. Soil permeability should be determined in the field using the procedures described here. What are general stormwater management guidelines for sites with low infiltration capacity soils? Local soil surveys should be used for preliminary determination of infiltration capacity of the soils on site; if the soil survey suggests soils with very low infiltration capacities, then alternative BMPs such as filters, wet sedimentation basins, etc. should be considered. If the survey suggests the potential for infiltration, the on-site soil testing should be done to accurately characterize site soils. The testing should be conducted in the most restrictive layer of soil that is found within 5-feet below the bottom of the proposed BMP. Soil compost amendments should be considered for lawns and other pervious surfaces to increase pervious area storage and/or decrease pervious surface runoff. Designers should also consider disconnection of impervious surfaces, by draining rooftops and other impervious surface runoff to compost amended pervious surfaces before collection and discharge into a structural BMP. Where volume reduction is a primary objective for a site (e.g., required by permit, potentially a receiving water-based goal due to channel erosion, nuisance flooding, or inadequate infrastructure capacity), emphasis should be placed on practices that promote runoff reuse and evapotranspiration such as cisterns, rain barrels, green roofs, and biofiltration in order to maximize volume reduction. A mounding analysis should be conducted to ensure that any groundwater mound that develops under a BMP will not extend into the BMP. This mounding analysis is especially important for soils with low permeability since such soils cannot efficiently dissipate groundwater through the soil column. This page was last modified on 13 September 2018, at 14:02.